If your bathroom is in need of an update, why not opt for the trend that's making its way into homes, restaurants and hotels alike. The industrial style is all about embracing raw, rustic design, a contrast to the traditional white, gloss bathrooms that have been a style staple in many homes. To make life simpler, we have compiled our range of designer brands that complete the industrial interior trend. When designing a bathroom, the finish of your taps may seem like a last stage decision. However, here at Real Stone and Tile, we believe it is all in the detail and that choosing the correct taps will ensure your desired look is complete. To achieve the industrial look in your bathroom, we recommend Italian brand, Nicolazzi. The premium brand handcrafts each product in-house, meaning that you will never have to compromise on quality as each product is designed and checked to ensure it matches their luxury, high standard. The brand provides twenty impressive finishes to choose from, here are two Nicolazzi collections that we are sure will inspire you! The Arena tap is available in all of the Nicolazzi finishes, however, we believe the matt black, grey and gold certainly complement the industrial theme. The tap is stripped back and paired with knurl handles creating an on-trend, edgy, mechanical look. The blunt, raw features allow the fitting to stand out, as the finish contrasts against softer bathroom styles. Available in all of the Nicolazzi finishes, we believe that rose gold will look perfect in your industrial bathroom. Compared to the Arena collection, the Agora's shine and tone create a slightly more elegant take on the industrial trend as the finish appears softer with a hint of glamour. Of course, no matter what suites and fittings you have in your bathroom the overall look is determined by the design of your tiles. When it comes to achieving the industrial look, the ever-popular, stone-effect tiles are perfect for creating an earthy, stylish appearance. Stone-effect tiles are a cost-effective alternative to using the real thing whilst the look isn't compromised and the same beautiful, high-quality appearance is achieved. Flaviker's STILL NO_W collection is available at Real Stone and Tile, featuring tiles in three impressive shades, gray, coal and sand. The range also boasts CONTINUA+ technology which ensures that the tiles are tough yet lightweight and easy to work within a variety of different areas of the home. 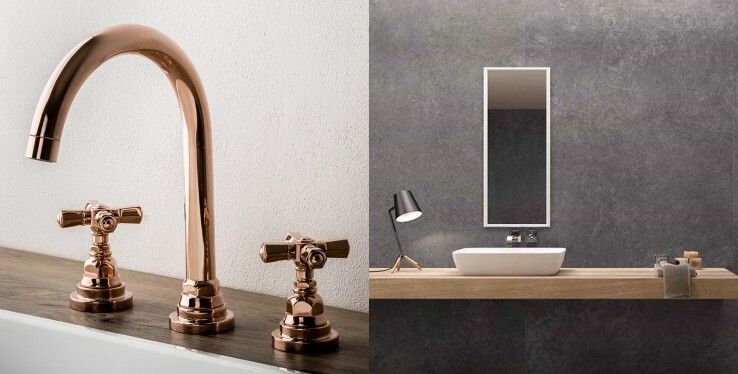 If you dare to be bold, the Still NO_W Coal is the darkest shade out of the three and paired with the rose gold Agora tap would enable the colour to really pop in the edgy, on-trend bathroom. The neutral look of this stone-effect tile is perfect for adding a sense of character to your bathroom. The cool, natural tones of the tile will ensure your bathroom remains stylish and on-trend, whilst providing versatility for potential future design changes. When it comes to stone-effect tiles, the STILL NO_W Sand is a much softer shade however, there is no need to stay safe when it comes to colour schemes as the lighter tones can perfectly contrast against black or grey fittings. The key to the industrial trend is combining contrasting design features with natural tones and textures against more rustic and edgy fittings, to allow for a modern, minimalistic to be achieved. Here at Real Stone and Tile we want to help turn your interior dreams into a reality, to help achieve this we offer high-quality, dependable products at affordable prices. For more information on the Industrial trend, the Nicolazzi and Flaviker STILL NO_W collections visit our Cheadle showroom or give us a call on 0161 485 1373.